This wonderful book describes the fascinating lives of the two most ubiquitous shorebirds in the world. Between them the Common Sandpiper (Actitis hypoleucos) and Spotted Sandpiper (Actitis macularia) make use of a large part of the world's terrestrial habitat and they exhibit many of the exciting features of shorebirds. As the birds arrive on the breeding ground, their displays are spectacular and their sounds are an exciting announcement of springtime. Unusually, the Spotted Sandpiper appears to be the only bird where the female is the territory holder, laying successive clutches of eggs for different males to care for, while the male of the Common Sandpiper holds the territory, has one mate, and shares most duties. They stay on the breeding grounds only as long as is essential to reproduce before making a migration southwards to a broad range of non-breeding homes in Central and South America, Africa, India, and eastwards to Australia with vagrants reaching as far as Tristan da Cunha and New Zealand. The Common Sandpiper has also been recorded breeding in East Africa and wintering in Scotland so their flexibility is amazing. The author has spent over 40 years studying the lives of these fantastic birds and provides a wealth of information including their breeding behaviour, migrations, distribution, food sources, habitats and their history from the present back to 36 million years ago. This beautiful book will hopefully stimulate others to watch these worldwide birds more appreciatively and add to our knowledge. 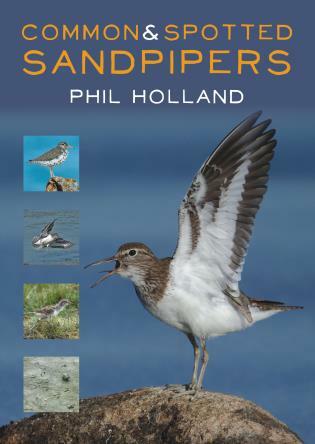 Phil Holland has had numerous articles on sandpipers published in ornithological magazines and bulletins.